Located in the most peaceful and scenic spot in the Kolea Beach Resort! This penthouse has been professionally decorated beyond the standard rental villa. Enjoy special upgrades such as surround sound, automatic retractable window shades for the great lanai doors and fabulous koa entertainment center as well as a koa hutch in the dining room. The view from Kolea 4F is exquisite as you look out over a lush green lot out to the ocean where the Humpback whales put on a spectacular show during winter. The main lanai is well furnished with full length lounge chairs, arm chairs, loveseat and a summer kitchen complete with a barbecue grill set in teak cabinets and granite. An outdoor refrigerator keeps those cocktails cool for you, while you relax to the sounds of the ocean and the picture perfect afternoon sunsets. There are three bedrooms and three and a half baths. The master bedroom has a king bed, walk in closet and private lanai. 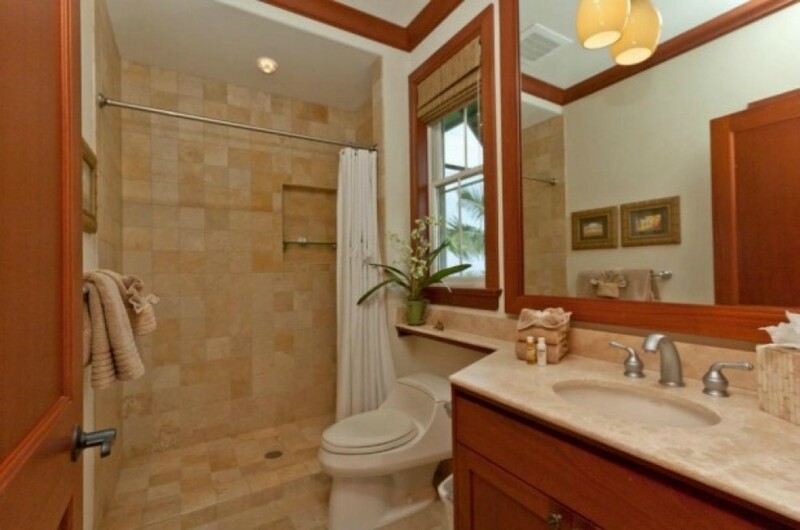 The master bath has dual vanities set in travertine, a deep soaking roman tub, and a walk in shower designed for two. The guest suite has a queen bed, walk in closet and private bath. This bath has dual vanities, a long deep soaking tub and walk in shower. The third bedroom is furnished with twin beds, and also has it’s own private bath with a walk in shower. The gourmet kitchen is fully stocked with kitchenware for dining in. All appliances are stainless steel built in models, set in luxurious African Mahogany wood and granite. The enormous kitchen island is illuminated by pendant lights which softly descend from the cathedral ceilings. The dining table has seating for eight, and bar stools provide additional seating for casual meals in the kitchen. The living room sports an oversized flat screen television with comfortable seating on the sofa and loveseat. Retract the lanai glass doors completely into the pocket to invite the warm tropical air, creating an enveloping outdoor feel within the villa. The half bath in the hall has a beautiful copper sink. At the end of the hall is the laundry room equipped with a full size washer, dryer and large sink. Upper floor villas in the front row buildings such as this one has a notable distinguishing feature. A private elevator is operational by key or by audio/visual intercom located within the front door, providing a secure safe haven for your island getaway. Kolea guests enjoy the use of the Kolea Beach Club which has a pool, spa, exercise hale and keiki pond complete with a waterfall and sandy bottom. Kolea is the only resort in Waikoloa which has direct beach access to grand Anaeho’omalu Bay. A short walk to this sandy beach and you will find activities such as snorkeling, glass bottom boat tours, paddle boarding and whale watch cruises. The Waikoloa Beach Marriott is immediately south of Kolea and the Hilton Waikoloa Village is north of Kolea. Both hotels offer dining, spa treatments or luaus. The Hilton is also home to Dolphin Quest. CURRENT SPECIAL: Ask About Our 7th Night Free Promotion! HOUSEKEEPING: DEPARTURE HOUSEKEEPING FEE $225 RENT: FULL RENT INCLUDING TAXES AND HOUSEKEEPING FEES WILL BE COLLECTED 60 DAYS PRIOR TO YOUR ARRIVAL DATE.